Tuesday night: Clear & cold. Teens & low 20s. Winds diminish. Wednesday: Clouds thicken. Chilly. Less wind. Low 30s. Thursday: Partly sunny. Near 40. A bright and sunny Tuesday with chilly air is in place after the passage of a cold front Monday night. This below-average airmass will stay with us all week long. After not needing the winter jackets Monday, we will certainly need them Tuesday! Plus, you’ll also need the scarf, gloves and hats. 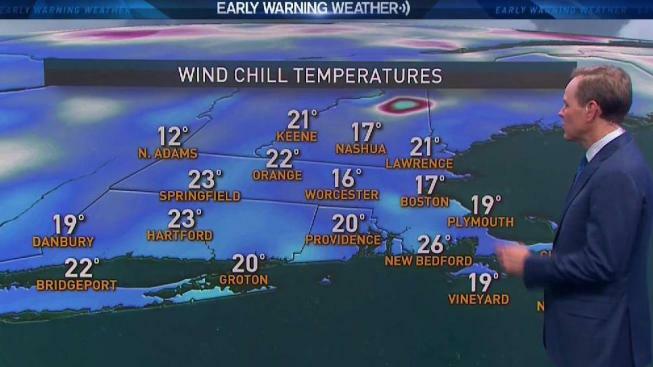 Highs this afternoon will be 20 to 25 colder than 24 hours ago across New England. A stiff wind is coming out of northwest, gusting to 25 mph, that will be responsible for wind chills in the 20s over Southern New England with teens and single digits to the north. The wind will decrease Tuesday night and by Wednesday, as high pressure is in full control, the wind won’t be an issue but temperatures are expected to barely reach the freezing mark. An area of low pressure will move well off shore, increasing cloud cover across the South Coast with a slight chance for flurries over Cape Cod and the Islands. By Friday morning, a cold front is expected to move in from Canada with a chance for snow showers towards Northern New England. It will serve as a reinforcing shot of cold air for the entire region, the coldest air since Thanksgiving comes in Friday night, and highs Saturday will be in the teens and 20s. On Sunday and Monday, our eyes will be focused on a snowstorm that will be moving across the southeastern United States, probably missing us. However, it may be too close for comfort so it’s worth watching. Our exclusive 10-day forecast indicates a possible warm up next week.